I have drawn Tiar again. Today he is at the top of the highest hill, playing for the larks. His tunes are so captivating that no wild creature can resist the sound of his silver flute, not even a creature who is also given to magical song. 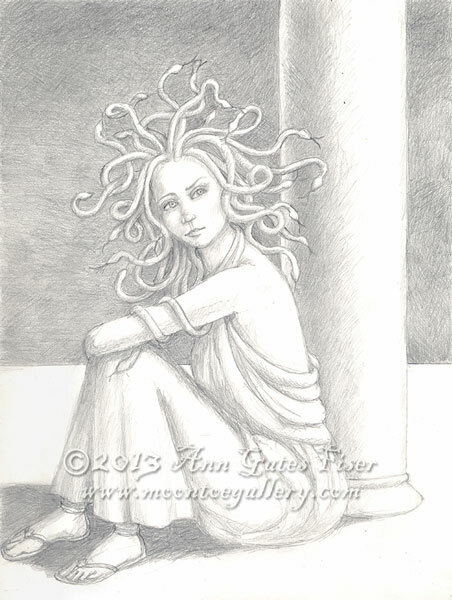 Medusa, or “M” to her friends was pretty sure she was having a really bad hair day. Which wasn’t unusual for her. She mostly had bad hair days, because she had particularly unruly hair that seemed to have a mind of its own. She would wash it and condition it and still she couldn’t get it to behave. When she asked her boyfriends if they thought it was OK, they would just stare at her in stony silence.